Identification: Males and females are very different. 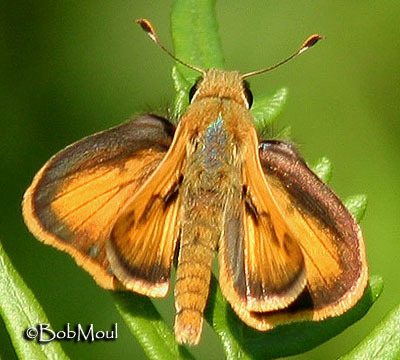 Male Upperside is yellow-orange; forewing has a black stigma and neighboring black square patch; black margins of hindwing are smooth inwardly. Underside is yellow-orange; hindwing has a few large blurred black spots. Female: Upperside is dark brown; forewing has a few clear spots. Underside is gray or sooty yellow with a central pale patch outlined with dark scales. Life History: Adult flight is quick and darting. 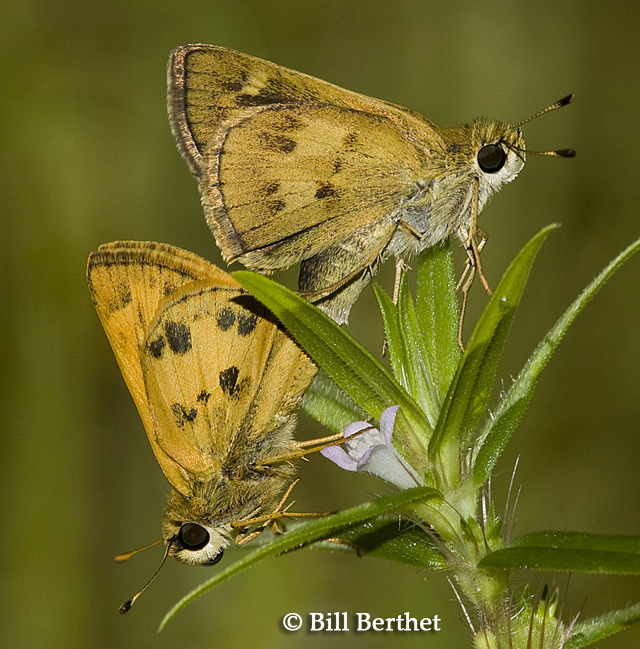 Females are usually found in forest openings or edges; males perch to await females during the afternoon. Caterpillars live in a tube of silked-together leaves and feed mostly at night. Flight: Two broods from April-September in the north; all year in Florida and South Texas. Caterpillar Hosts: Grasses including Bermuda grass (Cynodon dactylon), St. Augustine grass (Stenotaphrum secundatum), and thin paspalum (Paspalum setaceum). Adult Food: Nectar from flowers including shepherd\'s needle and lantana. Habitat: Scrubby or open habitats including dunes, fields, pinewoods, roadsides, forest openings, yards, and parks. Range: Southeastern United States and the West Indies south through eastern Mexico and central America to Argentina. Periodically strays north to northeast Iowa, northern Ohio, and Connecticut.